Trap-neuter-return (TNR) is recommended only for colonies of feral cats who can be returned to supervised sites where long-term care can be assured. Stray, domestic cats need to be re-socialized and placed in homes. Spaying and neutering colonies of cats: stabilizes the population at manageable levels, eliminates "annoying" behaviors associated with mating (fighting, yowling, and "spraying toms"), helps make the animals easier to deal with over the long term (re: trapping for future veterinary treatment), is more effective and less costly than repeated attempts at eradication is humane to the animals and fosters compassion in the community. The community, the caretakers and the property owner where the cats reside, should organize and carry out this plan. Money may be available from an established organization or may have to be raised by voluntary contributions. Local governments should be approached and asked to contribute to the fund, as TNR will save them money over time. The initial cost may seem high but the long-term costs are less than those spent on repeated eradication attempts. The major expenses are for equipment, veterinary services, and food. Identify all those who feed the cats and all feeding sites. Make a list of all the cats, their state of health, and whether females are pregnant, or feeding kittens. Identify the cats who are only occasional visitors or who are friendly, as these may be companion animals. All neighbors should be notified of your procedures before trapping begins to prevent them from thinking you will harm the cats. The location should be evaluated as to whether or not it is an appropriate environment in which to keep the colony. Buildings scheduled for demolition or areas too close to major highways may not be suitable. For the most part, the area where the cats are living is the best place to keep them. If relocation is necessary, find a suitable new location. However, relocation should be the last option. The planning group may be very creative in finding a solution. Euthanasia is only recommended for very sick cats who cannot be treated. Make arrangements for kittens and cats that may be tame enough to be domesticated after veterinary treatment. Rescuers and colony caretakers should sterilize all cats and kittens prior to adoption. They should charge an adoption fee which will help recover part of the cost. Early-age sterilization can be performed on kittens eight weeks old or two pounds in weight. Obtain humane traps and transfer cages, and learn how to properly use them. Make arrangements for transport, overnight stay, and delivery to and collection from the surgery. Don’t leave the cat in an unprotected trap and never leave the cat where she might be threatened by other animals, people, or weather. Immediately cover the trap with a towel or blanket when the cat is caught in order to calm her down. When one cat has been trapped, it can be moved to the transfer cage so that the trap can be used for a second cat. Do not trap in inclement weather, especially during heat waves - traumatized cats are very susceptible to heat stroke. The use of "rabies poles" and tranquilizers are discouraged. 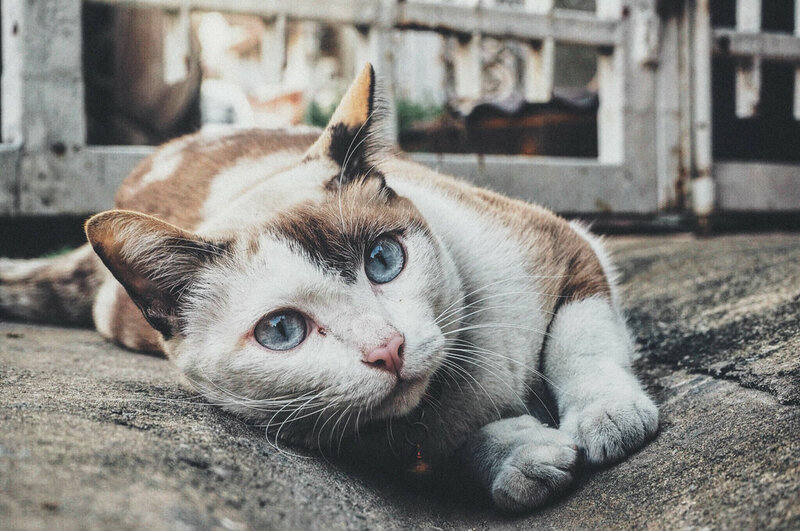 Tranquilized cats may leave the area before the tranquilizer takes effect and can get into situations that could endanger their lives, such as wandering onto busy streets. Do not trap lactating mothers, if possible. If, however, a lactating mother is trapped you need to make a decision on whether to have her spayed - she could be hard to retrap. If you keep her, find her kittens as soon as possible. Discuss the plan with the veterinarian and a possible fee reduction for the whole colony. Confirm beforehand that the veterinarian and technicians are aware that these cats are feral and prepared to treat them. A squeeze-side cage is an option for the clinic to use. A moveable panel in this type of cage immobilizes the cat allowing her to be tranquilized before handling. It is much safer for the veterinarian to tranquilize the cat through the bars of the trap. To avoid the necessity of a second trapping, dissolvable sutures must be used. Males should be fostered overnight and females, if possible, should be kept for two to three nights before returning. All cats to be returned must be identified by clipping one quarter inch off the top of the left ear. If the ear is properly cauterized, this procedure is trouble-free. All cats should be treated for worms and earmites, inoculated with a three-year rabies vaccine and distemper vaccine, and given a long-term antibiotic injection. Remember to inform the vet. that the cats are to be returned to their colonies. Taming & Domestication: Although some older feral cats can be domesticated, the best time to tame ferals is before they are eight weeks old. While it is possible to domesticate some older kittens and cats, if no homes are available and your local shelter is killing unwanted domestic kittens, a more humane and practical solution is to sterilize feral kittens from 12 weeks old, vaccinate, and return to colony. When returning to the original site is not possible, relocate the cat to a different site, such as a farm, a riding stable, or even a back yard, as long as new caretakers are willing to take responsibility for consistent food and shelter. Relocating may take several weeks or months and must be undertaken with the utmost of care. “Dumping” of feral cats in rural areas is strongly discouraged as the cats will, in all probability, move off and be unable to a food source. They may starve to death. If you do not confine the cats properly for 2 to 3 weeks, they may not remain on the property. This can lead to a similar situation as mentioned above. The long-term management of the colony should include arrangements for daily feeding, fresh water, and provision of insulated shelters as sleeping places with waterproof covers and straw. Dust bedding with flea powder to prevent infestations, and keep feeding areas clean and tidy. It may take several months to bring a large colony under control and achieve stable groups of contented and healthy cats. Any new cats attaching themselves permanently to the colony should be trapped and sterilized. Many of these may be tame, domestic strays. These should be resocialized and placed in homes. Feral cats can be re-trapped a few years later for booster rabies vaccinations, health check-ups, teeth cleaning etc. At this time, they will be more trusting of their caretaker and can be tricked into cages and traps. A plan should be worked out with the veterinarian where mild illnesses can be treated in the colony with antibiotics placed in moist food, to avoid re-trapping. Copyright © Alley Cat Rescue. All rights reserved.